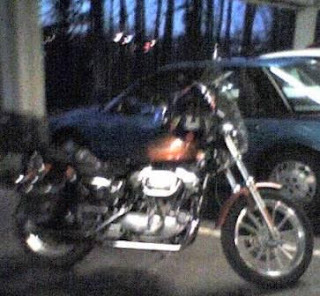 Here is my faithful steed "Autumn", a 2000 model Harley-Davidson Sportster parked at the office this morning. It was 30F (-1C) this morning and clear which spells a great day to commute on my bike. As I rode along in the brisk air, I thought how lucky I am not to be fighting all of the ice and snow that my friends in the north encounter this time of year. Watching the sun beginning to come up through a full face helmet with the chilly air wisking around my chin, I am grateful for feeling so alive. Riding a motorcycle in the cold is quite different from riding in any other situation. Maybe that's because our bikes tend to like that cold air. Are you Bogarting the left hand lane?